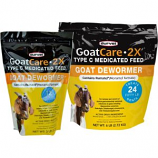 • For Removal and Control Of Mature Gastrointestinal Nematode Infections Of Goats. • Including Haemonchus Contortus, Oxtertagia (Teladorsagia) Circumcinta and Trichostrongylus Axei. • For All Class Of Goats. Feed As A Single Therapeutic Treatment At 0. 44Gm Of Moranteltartrate Per 100 Lbs. Of Body Weight. • Fresh Water Should Be Available At All Times. • When Medicated Feed Is Consumed Resume Normal Feeding. • May Require Retreatment In 2-4 Weeks. • For Removal and Control Of Mature Gastrointestinal Nematode Infections Of Goats Including Haemonchus Contortus, Ostertagia. • Safe For Meat and Dairy Goats, and Pregnant Or Lactating Does. • Feed Product At Rate Of 1 Pound Per 100 Pounds Body Weight As Single Feeding. • To Ensure Consumption Within 6-8 Hours, Normal Ration Can Be Removed For Up To 12 Hours Prior To Treatment. • Repeat Within 3-4 Weeks For Greater Worm Control and Removall. • Repeat Within 3-4 Weeks For Greater Worm Control and Removal.